I love it when I get to review a new-to-me product! Today I’m going to show you how to save money by lowering your electric bill AND how to decrease the amount of time spent nagging your family members. That’s right. A decrease in fussing at your kids with an increase in extra moolah for future DIY projects! We will also solve the age-old problem of pesky lights that require someone to actually turn them on and off. What a pain. Ain’t nobody got time for that *wink*. So what is this magical device of which I speak? It is called a Maestro Occupancy Sensor Switch by Lutron. You install the sensor switch and it automatically senses when you are in the room and turns the lights on for you. This is great in the laundry room or garage when your hands are full! If you forget to turn it off, it will sense when no one is in the room and turn off by itself. It won’t turn on automatically if there is enough daylight already in the room, so you’ll have to turn it on manually if you want it on. But it WILL turn itself off—so if your kids forget to turn off the lights in the bedroom, playroom, or bathroom Maestro has you covered. I asked Matt which room he thought most needed a little help from the Lutron Maestro switch. 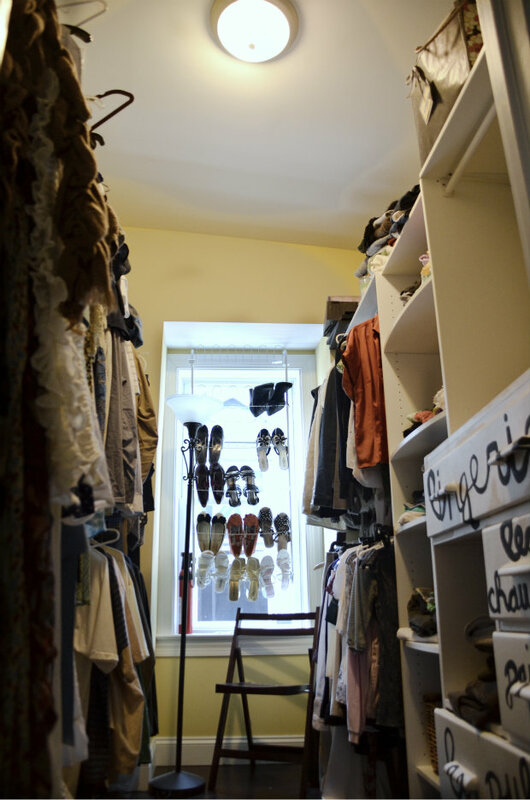 I thought the boys’ bedroom, their closet, and their bathroom would all be ideal choices. He said, “Well, OUR bedroom, our closet, and our bathroom rank pretty high on the list as well!” Oops. Busted. I am guilty of running downstairs quickly for something with the intention of returning and then I get distracted and the lights stay on. I decided to install the switch in our master bedroom closet. The single pole Occupancy Switch was very easy to install. I created the one minute video below showing how easy it is to install. Take a look! The only supplies I needed to install my switch were the Occupancy Sensor Switch (which include the wire nuts and switch plate screws), the directions, a screwdriver, and some pliers. My switches work on single pole switches which means that the light source is only controlled by one switch. 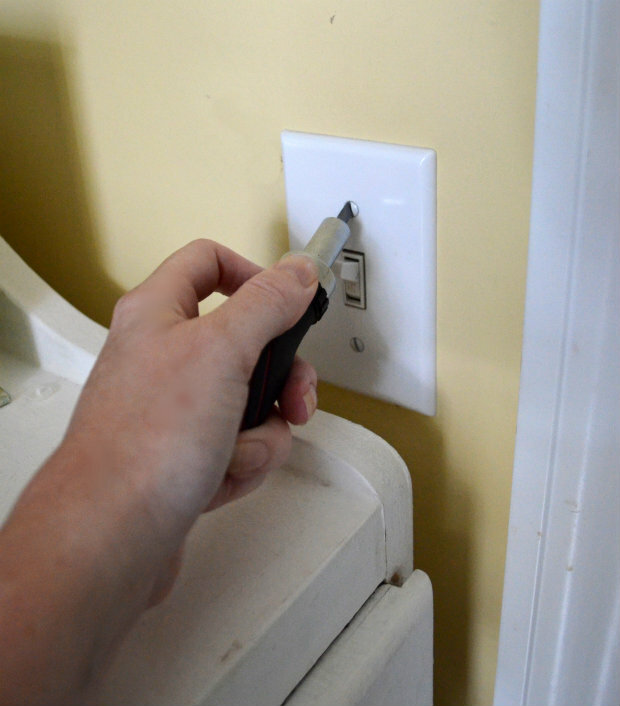 Step 1: TURN OFF YOUR POWER from the main source before you begin and double check to make sure there is no voltage coming into the switch you are working on. 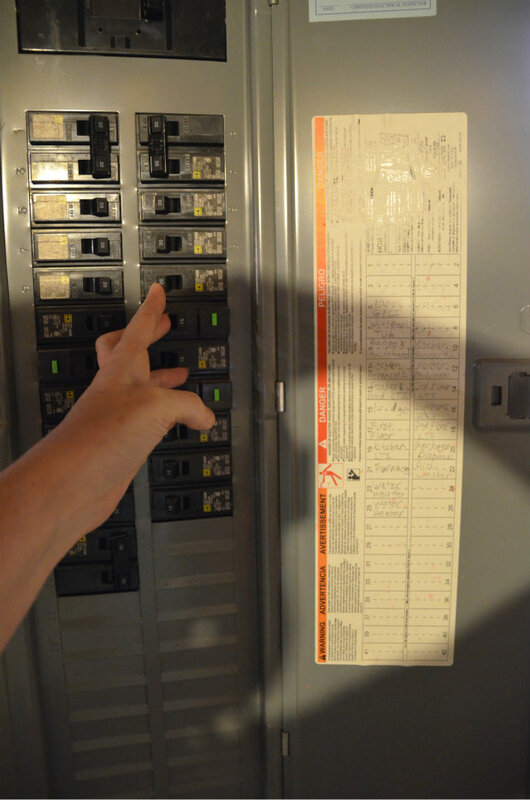 Confession: I sometimes just shut off the power to my entire house when doing anything electrical because I’m freaked out by the possibility of shocking myself. 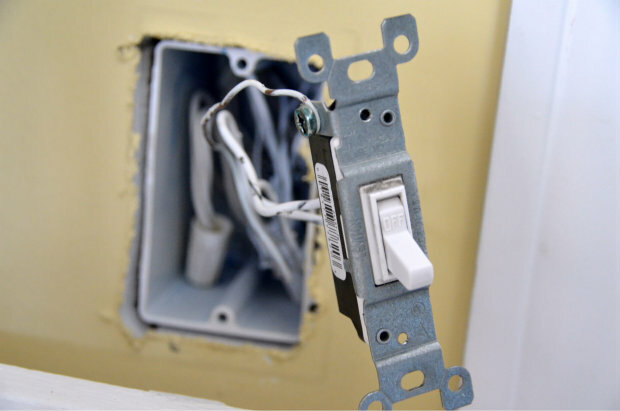 Step 2: Unscrew the switch-plate and the switch from the wall. 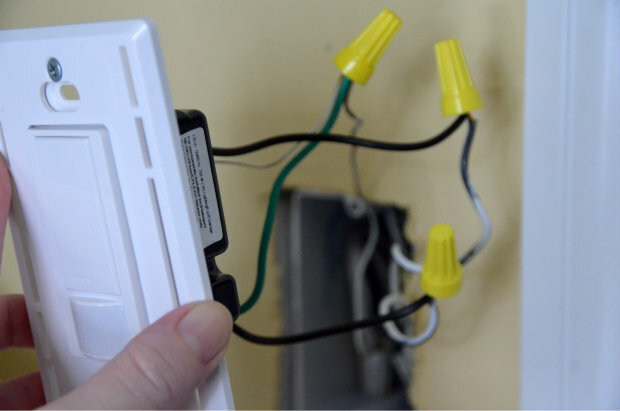 Step 3: Examine how your current switch is wired. Many times the screws and wires will be different colors but my wires were all the same color. The green screw is the ground wire. 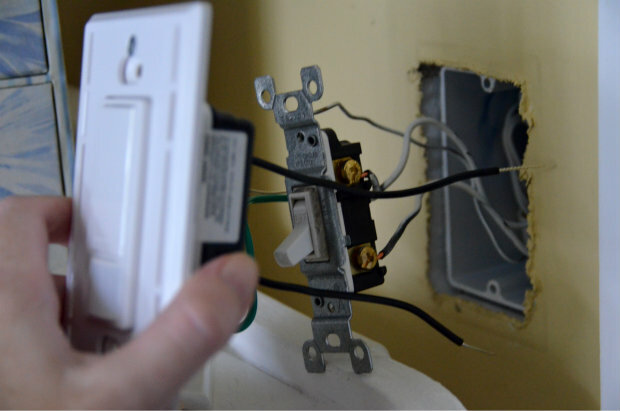 The switch will not work if the ground wire is not properly attached. Step 3: Feel free to call Lutron if you have any questions on which wires need to be attached. 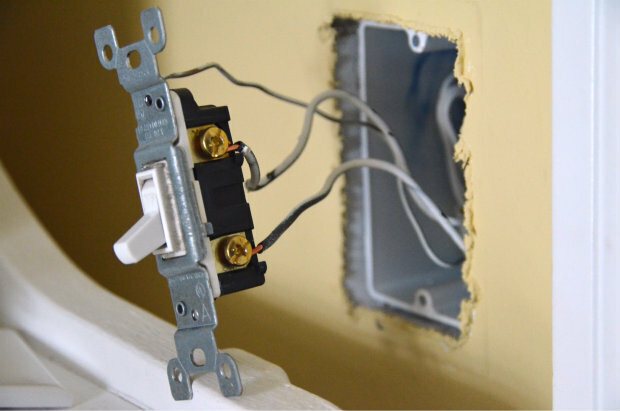 I followed the current wiring of my switch to attach the Lutron Maestro switch. 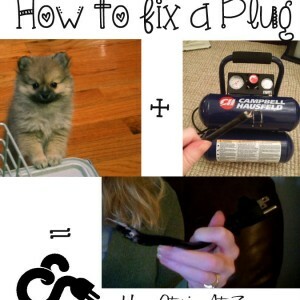 Step 4: Attach your ground wires first. 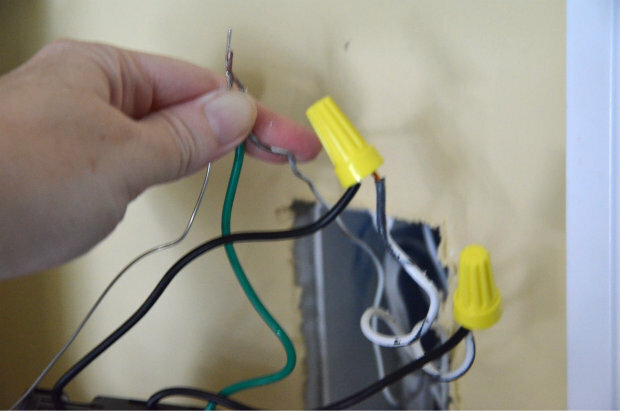 Bundle the wires and screw on a wire nut making sure that all of the wires are secure. Step 5: Attach the other two wires. 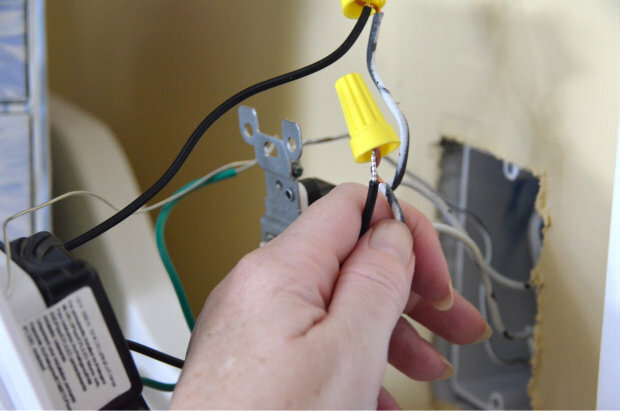 Step 6: Replace the wires back into the wall. Step 7: Secure the switch to the wall with the included screws. Step 8: Snap on the switch plate cover and you are done! I can rest easy knowing that Maestro will turn the lights off for me! Do you want to try the Lutron Maestro for yourself? I am giving away 5 single pole light switches to one lucky reader. Follow the directions in the Rafflecopter widget below to enter. You can visit ChooseLutron.com to learn more about all of the products they offer. I think you’ll love the hands-free options! If you don’t win the giveaway, here’s a coupon code for you! Offer: 25% off Maestro occupancy/vacancy sensor dimmers and switches on LutronStore.com PLUS one free Claro single-gang wallplate ($4.90 suggested list price) with each qualifying item. Disclosure: This post is brought to you by Lutron. I was given the product to try in my home. All opinions and thoughts are always my own. I’d love to try one in the bathroom and/or the closet or/and my office! What a luxury this would be! Always forgetting especially if its daylight still outside and don’t go in the room until the next day and guess what? Yep, left them on again! Of course its a good deterrent from robbers but they have think its a joke that they’re always on! I’m sure you’ll love yours!! I absolutely love this idea. My husband hates for us to use overhead lights but I prefer them. It would be awesome to use in our kitchen that is for sure. We are always leaving the lights on in there. Just what I need in my pantry. I always leave the light on because I have my arms filled. Great Idea! We were JUST “talking” about this last night! We would need one in every room… but especially our bedroom. It’s very well lit, but we turn on the lights as we enter, out of habit, and then forget them on. 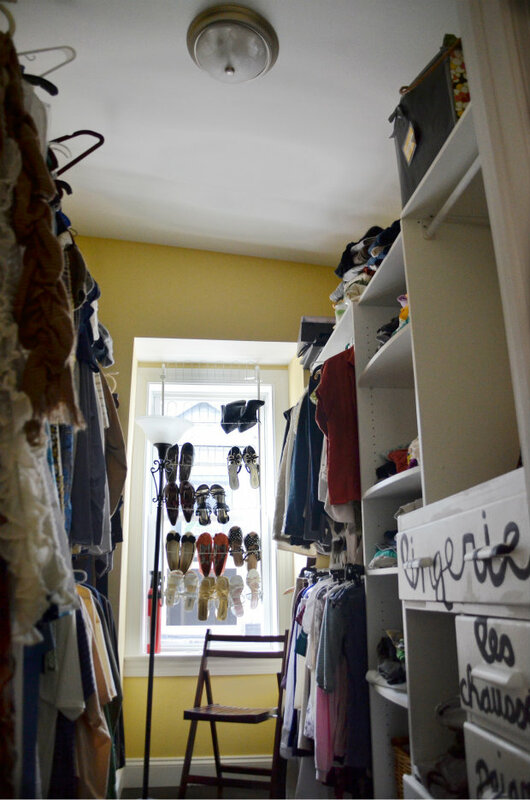 And our closet has a door on it, so we forget that one on all the time! I’d use it for the laundry room, which is dark and we need to walk halfway to the opposite wall to get to the light switch! I definitely need this in our basement, everyone leaves that light on! Oh how I want one of these! 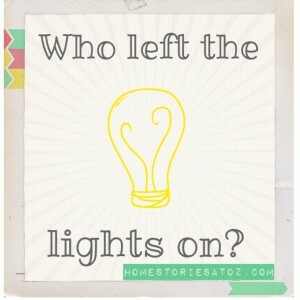 Sadly not because I have kids that forget to turn off the lights (I don’t have any yet…and I live alone) but because I always forget to turn off the bathroom light… (hang head in shame). I have 2 different lights in my bathroom, the 1 I am great at turning off (I only use it when I’m getting ready to go out somewhere that I need to look good for) and the other I am for ever forgetting to turn it off. And the worst part is that sometime I don’t even need to turn it on, it’s just habit. I love it. The kitchen and bathrooms would be a great place to have it, as well as the kids rooms for sure. I could use this in our “new” old house! 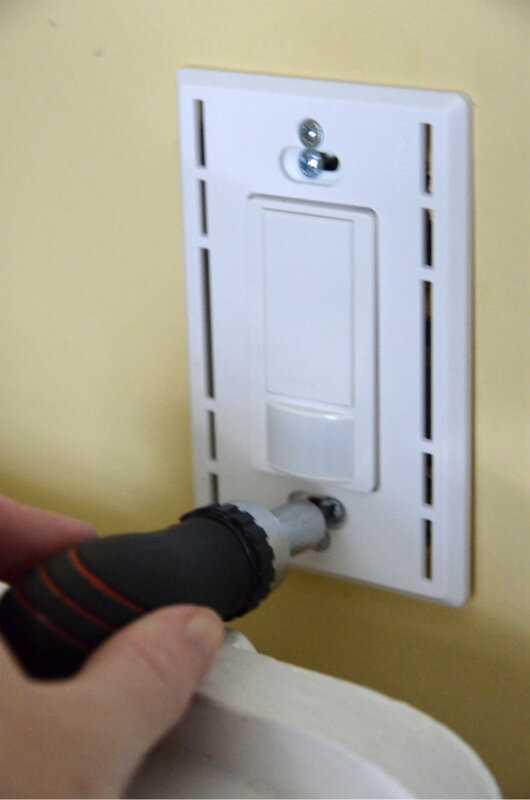 This is such a great idea and looks super easy to install. I would love to win! The hall bathroom could really use one of these. My daughter just doesn’t seem to know how to turn the light off. LOL! I was thinking the laundry room and master bath, but those both have so much natural light that I only use the light at night. I don’t need it coming on during the day when I walk in. So for sure the hall bath! Hi Jenny! Good to see you girl :). My kids never EVER turn off their bathroom light either. And you can use these in any room with a lot of daylight without worry that it will come on with motion. It only detects you when the room is dark so if the room is well-lit it won’t automatically come on (you have to manually turn it on in conditions like this). Pretty cool, eh? We are finishing our basement right now and that would be the perfect solution for the closets and storage room we have down there. Laundry room is my pick! This would be good in the kitchen. Sometimes there is so much traffic the light stays on, if it went off automatically that would be perfect! In the kids bedrooms…thanks for the giveaway! Would be great for the bathroom! The bathrooms and the laundry room! Boy do we need these for our laundry room, the point of entry from the garage. My daughter (who should know better) is notorious for leaving this light on when she leaves the house. Could also use this in my son’s room and our basement (the hubby). So cool! 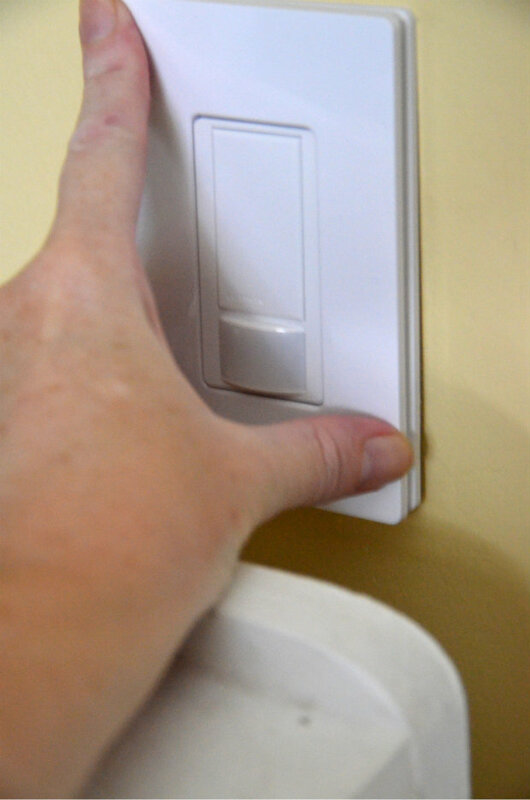 I’ve heard about sensor light switches and think they’re a great idea! But how would it work if you have pets who like to roam around the house? Great question! I wondered this too. This is what Lutron told me: Lutron has a Maestro occupancy sensor that is available with vacancy mode, which can be used if there is a lot of pet activity in that area. When using vacancy mode, you manually turn lights on when entering a room and the sensor will turn lights off when the room is vacant. Additionally, the sensitivity of the sensor can be adjusted based on the expected level of activity in the room (slight or large motions). More information can be found here:http://www.lutron.com/en-US/general/Pages/OccupancySensorPromo/Overview.aspx?utm_source=YouTube&utm_medium=MaestroSensors_MaestroSaveEnergy&utm_campaign=SocialMedia. That’s awesome! The things you can do with technology are truly amazing. Thanks for the info! We have a Lutron dimmer in my son’s bedroom – BEST. THING. EVER!!! It’s been moved with us 3 times now. 🙂 These would be excellent for the closets and pantry in our new house! Hi Maren! Ooo, good call on taking it with you to the new house. I want one for our laundry closet and pantry as well. 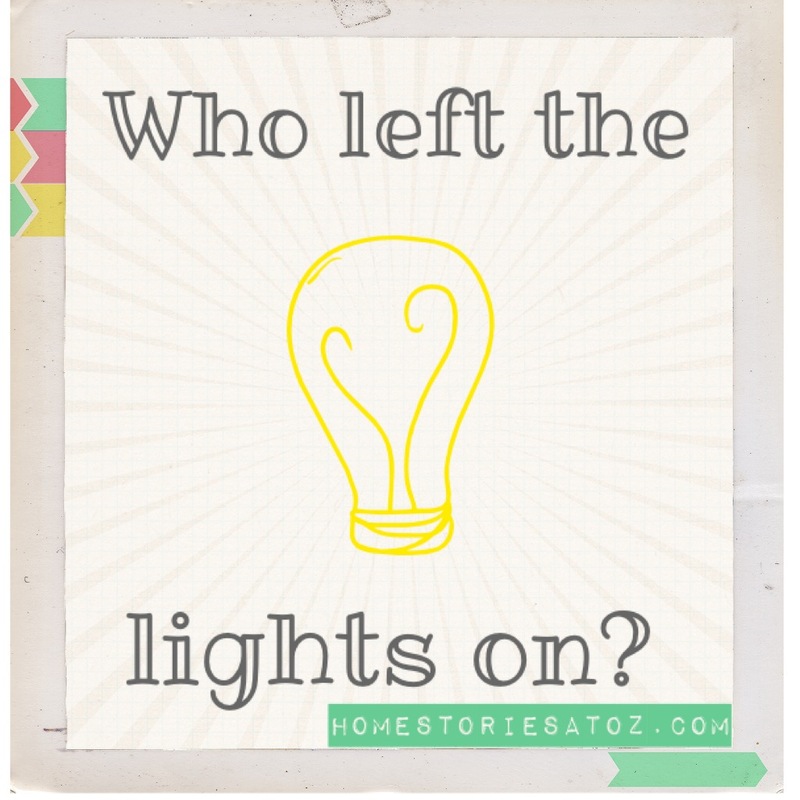 I can easily think of nine rooms that my kids and husband continually forget about the lights–I am guilty of leaving the garage lights on. If we weren’t moving to Germany in January, I’d install one of these babies in every room. What an amazing product! Thanks for sharing it with us. I find this amazing as well as practical. Bravo for such a cool idea. This is AMAZING. What a great idea! Definitely on my wish list and/or Christmas presents for family! This would make a super fun and very different Christmas gift. I hadn’t thought of that but my mom would love one for her laundry room too :). Good thinking Lisette! That’s cool, but how does it work for bedrooms. If you toss and turn of if you spouse gets up in the middle of the night will light come on? I was literally JUST talking about this very question with another blogger. If you install it in your bedroom, you have to change a setting on the switch to “vacancy” so that it won’t turn on when you toss and turn at night. You read my mind – I’ve been thinking about switches like these for my bathrooms and laundry room for a little while now! Thanks for the great post!